The Occult refers to the knowledge of that which is hidden. In common usage, it refers to the knowledge of the paranormal, as opposed to knowledge of that which is measurable, generally referring to science. For the occultist, it refers to the study of a deeper spiritual reality that extends beyond reason and the physical sciences, synonymous with esoteric. The occult also references a variety of magical organizations or orders. To Christians, the occult refers to the enemy, perhaps extending back to the Garden of Eden and the fact that it was the knowledge of that which God desired to remain hidden, the knowledge of good and evil, that resulted in the expulsion of mankind from the Garden and the fall of mankind. Occultism is the study of occult practices, which might include alchemy, astrology, divination, extrasensory perception, and spiritualism. Occultism can be found in philosophies of Gnosticism, Hermeticism, Kabbalah, Obeah, Theosophy, Eastern philosophies, Western esotericism, and Christian mysticism. While Christianity views the occult as an opposing belief system, some religions integrate the occult into their belief system. This is true of Wicca and other modern pagan religions. A number of secret societies exist, or have existed, which are based largely on the occult. These include Ordo Templi Orientis, Ordo Aurum Solis, Builders of the Adytum, the Illuminati, Rosicrucians, the Knights Templar, and others. For the purposes of categorization, some occult organizations, beliefs and practices are categorized elsewhere within our paranormal or religion categories. For example, occult practices that are part of a recognized religion should be listed within the specific religion category, if one exists. The appropriate category for any web site is the one that is the most specific to the topic. In the spring of 1989, I was living in the small city of Los Fresnos, north of Brownsville, in the Rio Grande Valley of Texas. I was a paramedic instructor with Texas Southmost College, just finishing up a class for the Brownsville Fire Department's EMS department, when a former student, a reporter for the Brownsville Herald, asked if I wanted to accompany him to a mass murder scene in Matamoros, Mexico. Tamaulipas State Highway 2 runs west from Matamoros to Reynosa, a route that I had traveled many times. Highway 2 is narrow, two-lane highway and, once you leave Matamoros, the land is rural and agricultural. Rancho Santa Elena, our destination, was about twenty miles from Matamoros, along a dirt road north of the highway. Just short of one mile in is the ranch itself, with some barns, other outbuildings, and agricultural equipment. Further down the road, separated from the ranch by a corn field, was a small shack, once used for storing hay or feed. Hundreds of people were there, including reporters from as far away as Japan. The stench of death was heavy in the air, but I couldn't see anything because of all of the people who were crowded everywhere. Someone was speaking through a loudspeaker but I couldn't understand any of it. Apparently, my friend was able to get enough information and a few photos, enough to run his story on the incident, and he was able to fill me in on the drive back to Brownsville. 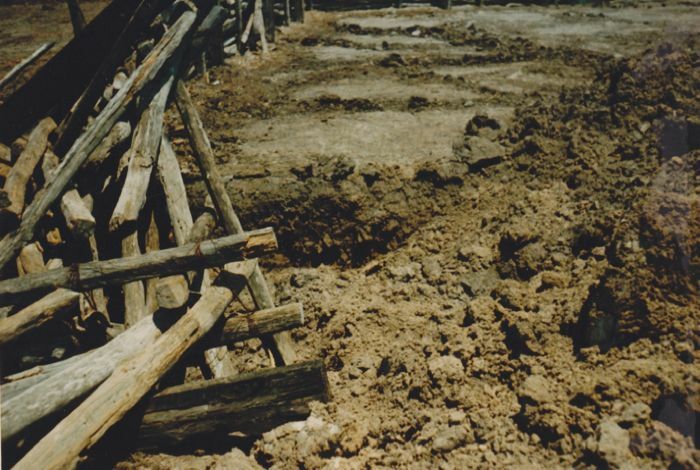 Fifteen or sixteen bodies were being dug up from shallow graves in a corral just behind the shack. One of the killers, Sergio Martinez, was at the scene at the time, being forced by the Mexican police to do the digging. They were the victims of ritual occult murders, committed over a long period of time. Some of the killers were American citizens, and one of the victims was Mark Kilroy, a twenty-one year old college student from Santa Fe, Texas, whose disappearance had been a common theme in the press at the time. Led by Adolfo de Jesus Constanzo, a Cuban-American from Miami, and Sara Aldrete Villarreal, a Brownsville resident, the group practiced a religion that was a mixture of Voodoo, Santeria, Palo Mayombe, Santismo, Satanism, and the writings of Carlos Castaneda, all supported by a massive drug smuggling operation. Santeria, an offshoot of Voodoo, is common in the Rio Grande Valley of Texas, and wherever there are heavy concentrations of Hispanics, although the religion is generally interwoven with Catholicism, with Santerian saints being represented by Catholic saints. Palo Mayombe is sometimes described as the dark side of Santeria. Carlos Castanada came to the United States from Peru, and became the author of a series of books on shamanism that were popular in the 1960s and 1970s. Adolfo Constanzo was raised in Santeria and, from an early age, he was thought to have powers that were sought out by many, including the ability to foretell and affect the future, and to cleanse a client's soul of evil. His clientele came to include government officials, police offers, drug dealers, and people from all walks of life, especially after he moved to Mexico City in 1983. Sara Aldrete was a student, and part-time employee, in Texas Southmost College's physical education program. A friend of mine, an instructor with the TSC physical education department, knew her well, but only in the setting of Texas Southmost College, describing Sara as being a little odd, but was shocked to learn that she had been involved in mass murder. Some of her fellow students recalled that she wore a necklace that appeared to be made of bones, but they never considered that these bones were even real, and certainly not that they were the vertebrae of murdered victims. Among the other members of the cult were members of a large-scale drug smuggling family, including Serafin Hernandez, Jr., who was also enrolled in the law enforcement program at Texas Southmost College. The crimes were discovered after David Serna Valdez, and three other members of the group, ran through a narcotics interception roadblock near Rancho Santa Elena, believing that, because of their magical powers, they would be invisible to police. The authorities followed the silver Chevrolet onto the property, where they found marijuana and a revolver in the car. After thirty-six hours of questioning by Mexican police, the four men confessed, and led the police to the shack where the ritual killings took place. They told how Constanzo had brought them together using Santeria practices until about nine months before, when he began using the rituals of Palo Mayombe, which called for human sacrifices. In return, members of the cult hoped to receive strength, riches, and protection from the police. There were other victims besides those unearthed at Rancho Santa Elena. An uncertain number of victims are believed to have been murdered by the group near Mexico City, where the cult's leader, and other members of the group were later killed or captured, and a search of Aldrete's home revealed an altar with bloody clothing belong to children, although no bodies were discovered. It is believed that the group's victims numbered around one hundred. A few days after my first visit to the shack at Santa Elena Ranch, I returned, this time with another friend of mine, who was then a dispatcher for the South Padre Island Police Department. We expected to be turned away but, as we passed the ranch, we could see one Mexican police car in the driveway, but there was no one at the shack or the area around it. The collection of evidence in Mexico differs from what we might expect in the United States. As we approached the shack, we could see that the murder weapons, a machete and a very large screwdriver, had been returned to the scene, and were lying on a porch area just outside the shack. The ground outside the shack was covered with used small caliber shell casings. 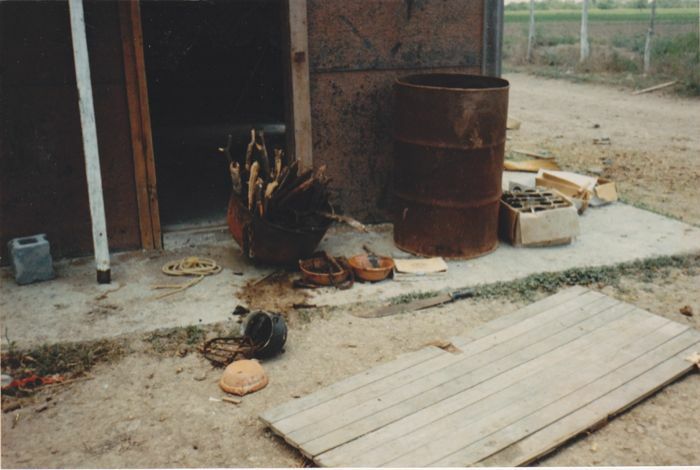 Just outside the doorway to the shack was a large caldron, known as a nganga, which had several bloody mesquite sticks protruding from it, and contained a bloody mess that, I later learned, include a goat's head, turtle parts, portions of Mark Kilroy's brain, and dozens of gold-colored beads. Alongside the nganga were some wooden bowls, one of which contained what appeared to be several pennies, lying in blood. A metal drum was filled with empty corn liquor bottles. A large cross, constructed from what appeared to be the branches of a tree, was leaning against one side of the building. The cross was not there on my previous visit. If anything, the stench was worse than it had been a few days earlier. Inside, the floor of the shack was badly stained with blood. Placed along the floor were partly-burned votive candles, and a few boxes of unused black and white candles. Strewn along the floor were cigar butts, peppers, corn liquor bottles, and broken glass. On a back porch was an altar made of concrete construction bricks. The altar, and the wood floor beneath it, were covered with blood. Behind the shack was the corral. The graves had not been recovered, and bone fragments were left lying about, along with a few Texas license plates. We didn't stay long, in part because of the smell, but also because we were afraid that the Mexican police would be along at any time. Only a few days after my second visit to the shack, I read in the newspaper that it had been burned. While not reported in the newspaper, from local knowledge the murder weapons had been returned so that the area could be cleansed by fire. The cross that we found leaning up against the wall was a part of the cleansing ceremony, and the fire completed it. Composed in English and translated into Chinese, Dutch, Japanese and Spanish, this site reveals and discusses the origins of various occult practices such as channeling, palmistry, voodoo, crystal healing, out of body experiences, Wicca spells, Satan worship, Celestine prophecy, ouija boards, and tarot cards. For some topics, video is included. The Christian response to the occult is presented, along with Bible search and study tools. Based in Great Britain, the School offers courses by correspondence only, with no personal contacts or group meetings. An overview of the school and what it has to offers is provided, and students my apply for membership online, and its terms and privacy agreements are included. Testimonials from members are offered, and general information about occult knowledge, truth, and teachings is put forth, along with occult masters, suggested books, and other resources. The occult is the focus of topics discussed on this online forum, including ceremonial magic, the Cthulhu Mythos, chaos magic, the Eastern paths, indigenous paths, paganism, monotheism, technomancy and witchcraft, as well as cryptozoology and the paranormal, divination, spells, rituals, spirit guides, and healing practices. Registration is required for participation, but an account is not necessary for viewing the forum. Utilizing a phpBB script, the online forum requires registration in order to participate in discussions. Topics include an introduction to the site and a guide to participating in discussions, as well as magic, mythologies, occult religious groups and faiths, media and mediums, such as art, literature, poetry, chants, cants, and crafts. Games, television programs, video, and other digital expressions of the occult are included. The creators of this site have assembled fragments of the Ancient Wisdom taught be occult teachers, philosophers and messengers of the past, presenting them in a modern way. The study of occult science is addressed, along with topics such as the science of symbolism, the esoteric meaning of Easter, esotericism in the Nativity, the hidden wisdom in the Bible, the magic of water and salt, and occult maxims. Books on the occult, philosophical, scientific and religious subjects are reviewed. Also known as the Center for Metaphysical Research, Study of Spiritual Sciences, Astral Entities and Energy Systems, the spiritual organization teaches palmistry, numerology, hypnotism, past life regressions, and research on life after death, dream symbolism, out of body experiences, as well as other spiritual solutions and protection against black magic, witchcraft, and dark energies. Testimonials are presented on the site. The site offers a study of the occult, as well as a synopsis of the author's book, entitled "The Lost Age of High Knowledge." Topics include, among other things, an introduction to the mysteries, Revelation and the Red Dragon, ancient Egyptian astronomy, the lunar cycle calendar, the long count Mayan calendar, galactic alignment, sacred geometry, the Great Pyramid of Giza, pyramid power, the Echelon NSA program, the HAARP Complex, as well as the author's video lectures. The site delves into a number of topics, including, but not limited to, alchemy, aliens, alternate universes, astral projection, Atlantis, clairvoyance, crop circles, crystals, crystal healing, the Cthulhu Mythos, demons, divination, esoteric studies, the I Ching, the Illuminati, Indigo children, the Kabbalah, meditation, metaphysics, mysticism, New Age religion, the occult and other paranormal topics. Electronic books and software are available for download, and a discussion forum is available. In this online encyclopedia of the occult, the authors seek not to promote or discredit beliefs or opinions about any of the topics included, but simply to inform as to the meaning of the words or terms, for the purpose of defining and providing an understanding of the subject matter. Content may be found alphabetically or by topic, and a feature is included to permit site visitor to submit additional terms. Informational articles, charts and other resources are offered on topics such as dream recall, hypnotism, moon phases, planetary days and hours, numerology and numerology readings, tarot and angel cards, pentagrams, black mirrors, pendulums and dowsing, ouija boards, spells, candle magic, witchcraft and sorcery, omens and beliefs, as well as other subjects, such as Puzuzu things. Occult and metaphysical books and other items are offered for sale. Search for Occult on Google, Bing, or Yahoo!